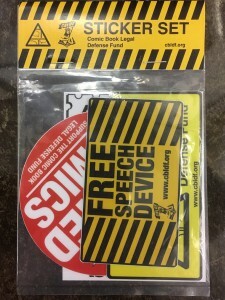 Show Your Support for Free Speech With Brand-New CBLDF Gear! CBLDF is back from San Diego Comic Con and rewarding your donations with some great new gear! 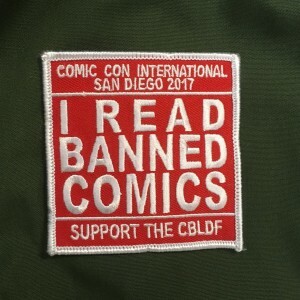 Don’t miss out on our Bill Gaines pin, “I Read Banned Comics” patches, the CBLDF-exclusive Secret Weapons #1 SDCC Liberty Variant by Erica Henderson, and many more! Our quantities are limited on many of these items, so donate today to grab yours before they’re gone! 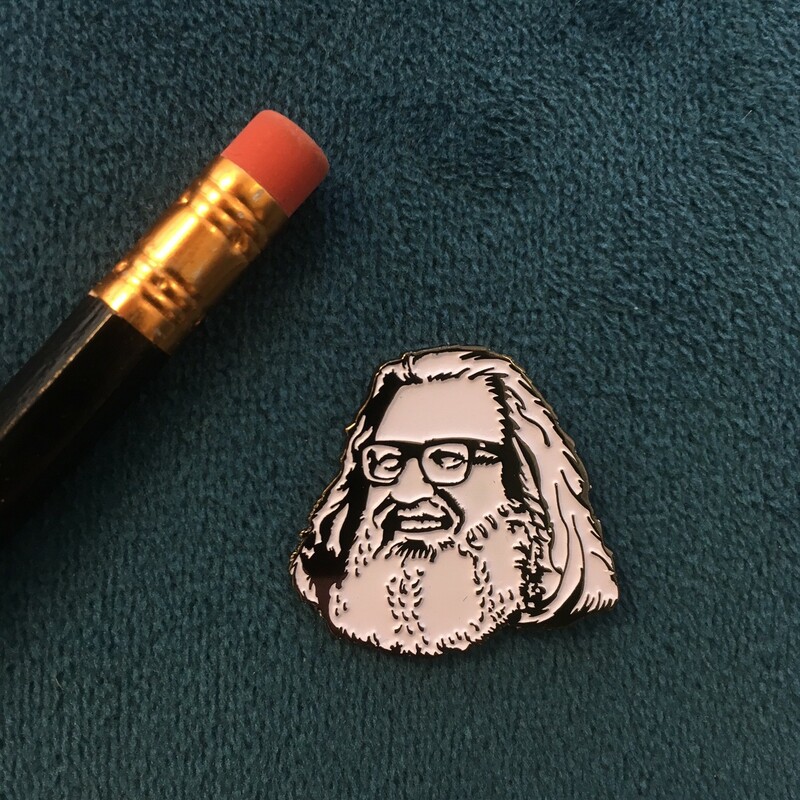 Don’t miss out on our new Bill Gaines pin, first made available at SDCC 2017! 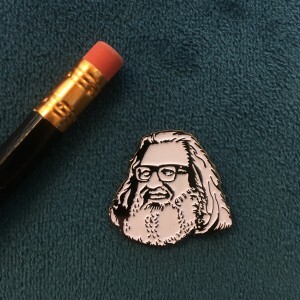 The talented Tony Shasteen (Star Trek) supplied the artwork for this beautiful pin, originally featured on our “Bill Gaines Was Right” t-shirt. Donate today to get one of your very own! 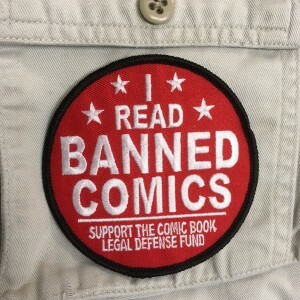 Show your support for CBLDF and the right to read with these fantastic new patches! We’re offering a round patch as well as a square patch commemorating SDCC 2017 — donate today to grab yours! Grab our brand-new sticker set and get four beautiful designs, printed on vinyl and perfect for phones, notebooks, or your car’s bumper! Get your hands on our new and classic designs by donating here! 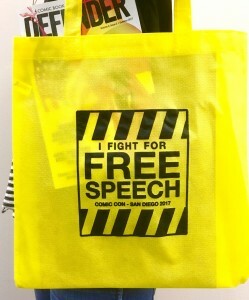 Make a statement with this brand-new, CBLDF-Exclusive “I Fight for Free Speech” tote bag! This bag commemorates SDCC 2017, and there are only a limited quantity available! Don’t miss out, donate here to get yours! 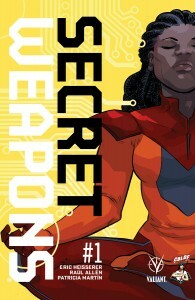 Thanks to our friends at Valiant Entertainment, we’re proud to offer a CBLDF-exclusive Secret Weapons #1 Liberty Variant, with cover artwork by Erica Henderson (Squirrel Girl, Jughead)! This hotly-anticipated book, written by Academy-Award nominated screenwriter Eric Heisserer (Arrival) and illustrated by Harvey-Award nominated artist Raul Allen (Wrath of the Eternal Warrior), has been so well-received that it sold out of its initial print run! We have a limited quantity on hand, so don’t wait, donate here to get your own copy today! Don’t miss out on these great items and more — visit the CBLDF Rewards Zone today! 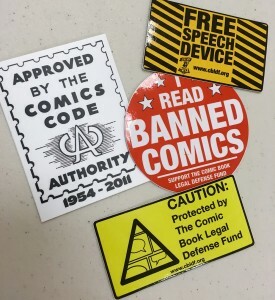 All proceeds benefit CBLDF’s important First Amendment work!